It appears that if you kill the Petrifying Statue Clusters to their spawn limit, the last one will drop a Promised Walk of Peace hex. In the room with the various statues that needed to be destroyed in order to defeat the Ghost Sanctum Knights in Dragon's Sanctum , you'll find the Eternal Sanctum Key . Then return to the door in the beginning of the Sanctum that was locked, and unlock it with your newly acquired key. Kill the two Sanctum Priestesses inside and open the chests to obtain a total of: 8x Dried Root , a Lightning Clutch Ring , and 2x Bonfire Ascetic. Go up the carved ladder on the left wall in the end of the room, up the stairs then up the next ladder. 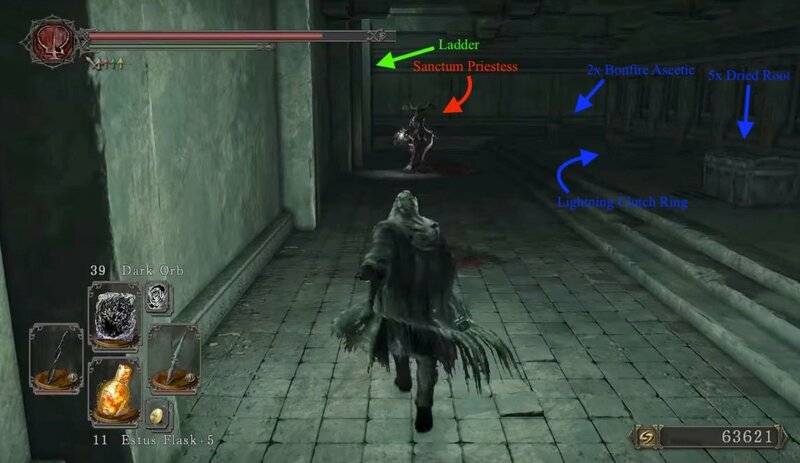 As you emerge from the ladder, 3 Corrosive Egg Crawlers will drop from the ceiling, kill them and head up the ladder straight ahead to find a chest containing a Sanctum Shield . There is also a balcony here where you can set light to two sconces, but not much else. Head back down and across the bridge. 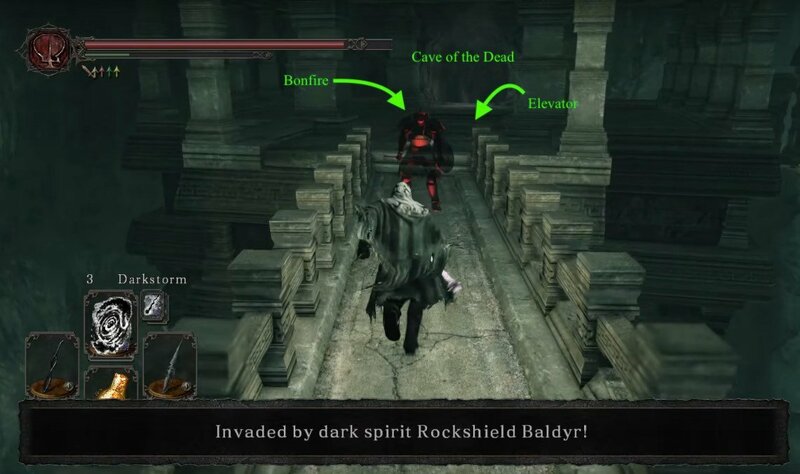 At the end of the bridge you will be invaded by Rockshield Baldyr . Defeat him to access the Priestess' Chamber bonfire, shortly after. 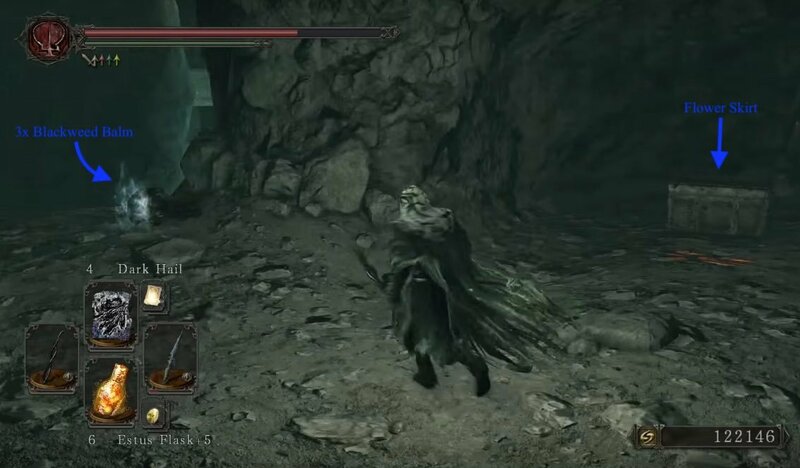 Hit the obelisk at the entrance of the cave to activate the elevator nearby. Take the elevator down then roll/jump off it when you see a ledge. On the right is a body that has 5x Torch, while the other side holds a path leading down and around the building. You will arrive at a doorway which leads to a chest containing the Hex, Dark Greatsword. 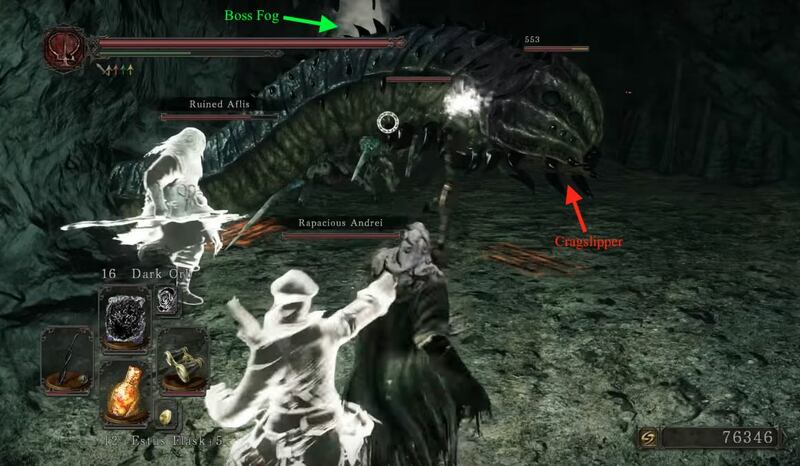 Alternately, you can access this area after killing the boss of this area. Homeward Bone back to the bonfire and enter the cave and at the end of the corridor to find a fog gate. Cross it to enter the Cave of the Dead. Drop down the ledge, and if you are in human form, find two NPC summon signs for Rapacious Andrei , and Ruined Aflis . Drop down the next ledge and you will find a room with 3 Sanctum Soldiers, many Petrifying (red-eyed) Statues, and a few holes in the ground. Kill the enemies before dropping down the second hole on the right. You will be in a room FULL of Petrifying Statues, and a few Poison Statue Clusters and Sanctum Soldiers. Navigation is hard, but there is only one exit in the room, the aforementioned hole the player has to drop is the closest one to the exit. In the room there is a metal chest that contains 3x Petrified Something , a corpse with 2x Brightbug, and another holding 3x Bonfire Ascetic . When you find the exit, drop off the ledge. This new room contains 3 Petrifying Statue Clusters, several Petrifying Statues, a Cragslipper, and three 3 Sanctum Soldiers beyond it. 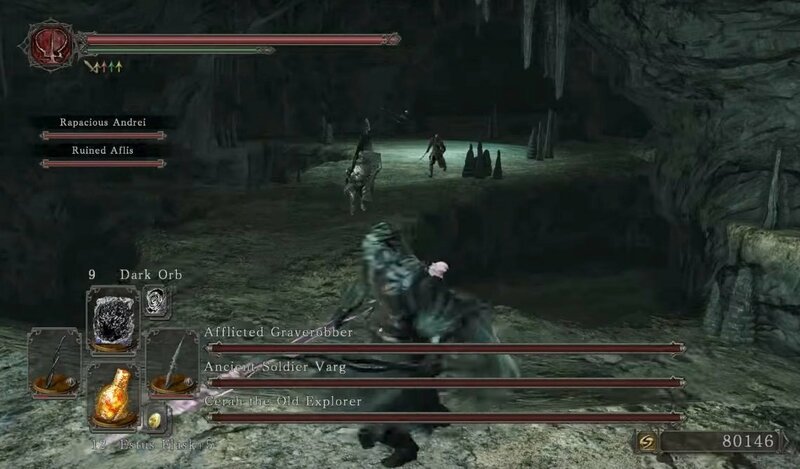 Boss Fight: Graverobber, Varg, and Cerah . Go to the opposite side of the entrance of the room and you will find a chest containing a Flower Skirt , and a corpse holding 3x Blackweed Balm . To exit, you can simply use a Homeward Bone or Aged Feather or fall down the hole in the end to drop into the area where you found the Dark Greatsword hex. From here go back to the body that had the Torches and jump to the platform below. From the platform roll down to the entrance of the building, take the elevator and you'll arrive back at the bonfire.